Who our parents are, our health at birth and how we live, eat and play as young children all have an impact on our adult life. As the first Early Years Study proposed, the outside world gets under the skin.1 Even during gestation, the environment of the fetus—nutrition, pollutants, drugs, infections and the mother’s health, well-being and stress level—infl uences how genes are expressed and the architecture and function of our brains. Neuroscientist Marla Sokolowski investigates the genetic, molecular, neurobiological and environmental underpinnings of behavioural variation in the fruit fly Drosophila melanogaster.3 In particular, Sokolowski and her colleagues have investigated the foraging gene that affects how these insects search for food. All animals have this gene, which influences energy balance, food intake, food-related movement, how much fat an animal has, learning and memory. In the 1980s, Sokolowski classified two variations of the gene: rover and sitter. The foraging gene makes a brain protein enzyme called PKG. Rovers have more PKG in their nervous systems. How much PKG is produced depends on the fruit fly’s early environment. “We study the mechanistic and evolutionary significance of genes that affect larval behaviour by isolating, identifying, cloning, and sequencing these genes and also by understanding how variation in gene expression can affect the fitness of the organism. Gene discovery in Drosophila has proven useful for understanding how homologous genes function in mammals,” Sokolowski explains. The rover and sitter characteristics describe how fruit flies behave when food is plentiful. But when food is scarce, rovers turn into sitters and they conserve energy by moving less. They produce less of the foraging enzyme. The environment and genetics have interacted to affect the biology and behaviour of the organism. Based on her research with rover and sitter fruit flies, Sokolowski has gone on to identify the foraging gene in humans. She is using it to screen samples of DNA from people with eating disorders to find how genes influence food intake and energy output. Her work holds promise for understanding and treating obesity and other food-related disorders. Ideas about how genes influence behaviour, learning and health must incorporate the nature of individual differences in the interplay of genes and environment. Scientists now suggest that different alleles (that is, forms of the same gene) confer different sensitivities to a given environment. Our understanding of epigentics took a qualitative leap forward in 2003 with a litter of brown mice born in a laboratory at Duke University. The babies were brown and skinny; their parents were fat and yellow, from a long line of mice specifically bred to carry a gene called agouti, which gave them their distinctive colour and a propensity to obesity. The only change in treatment of the mice mothers were vitamins added to their diets during pregnancy-—very similar to those given to human mothers—vitamin B12, betaine, choline and folic acid. A genetic examination of the brown babies found the agouti gene still present, but it was not expressed. Something in the supplements given the mothers had suppressed the gene. This process is known as DNA methylation. Svelte figures and a new coat were not the only advantages of improved nutrition in utero. As adults, the brown mice were much less likely than their parents to develop diabetes or cancer. This study erased the premise that genes contain blueprints that cannot be changed. Rather, the exact same set of genes can produce different outcomes depending on which genes have been stimulated to undergo methylation and which have not. All cells growing from a fertilized egg contain the same DNA. A single cell, or zygote—the product of an egg cell from the mother and a sperm cell from the father—contain the genetic instructions to differentiate the billions of different forms and functions that make a human being. Three billion pairs of nucleotides, called DNA base pairs, carry out these instructions. In 1957, following the discovery of DNA, developmental biologist and geneticist Conrad Waddington argued there had to be some process in the body that regulates gene function to produce the diversity necessary for development. He determined that specific sequences of DNA and controlling proteins in each cell determine which parts of the genes should function and which should not.7 He believed that environmental factors and experiences determine how gene regulation works. Nurture is one of the powerful stimulations in early life that affects the pathways that enable cells with the same DNA to function differently.8 Genes listen and respond to the body’s internal and external environment, and the cells differentiate for their diverse functions. Epigenetics is any process that can alter gene expression without changing the DNA sequence. Many of these changes are temporary, but others seem to be enduring. Identical twins have the same DNA (genotype) in their cells, yet show different gene expression (phenotype). Since each identical twin has the same genes, one could expect the same phenotype. However, because each twin will not have exactly the same experiences in early life, there will be different effects on gene expression. Non-identical twins have different gene sequences, so that two people who are exposed to the same environment will have different reactions—the “gene-by-environment” interaction. During the prenatal and early childhood periods, a child’s genetic make-up is programmed to adapt to different experiences. The process involves subtle changes in brain chemistry. 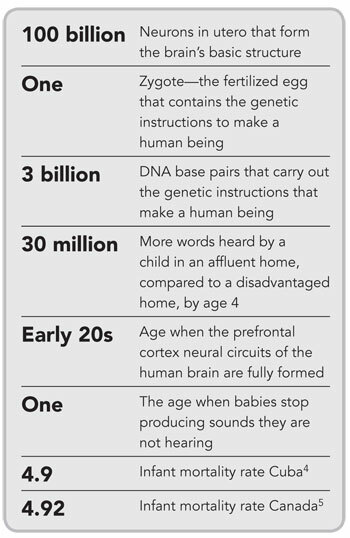 What happens in the infant’s world—for example, a caring caress versus a harsh voice, what she is fed or the smoke from a parent’s cigarette—is stimulation that is carried into the brain as an electrical signal. The signals create a biochemical cascade that can trigger structural and chemical changes to the building block components of DNA. When the signals are sustained or frequent in the child’s daily life, the chemical cascade leaves behind distinctive patterns of a methyl compound that in turn affects how genes express themselves. The DNA blueprint now carries a personalized signature. Scientific studies of the blood and saliva cells of animals and children suggest that methylation patterns differ noticeably with exposure to positive and negative stimuli.9 Evidence to date suggests that early experiences—particularly experiences related to early nurture and nutrition—have the capacity to leave epigenetic marks that are greater than those associated with later experiences. It seems that changes related to the effects of trauma or the effects of exceptional nurturance can be passed along from one generation to the next.